Today we are chatting about the signing habits of New Jersey Governor, Chris Christie. Governor Christie is an often talked about candidate for president in 2012. 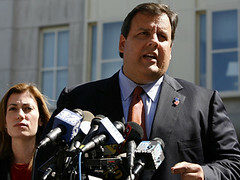 He has made a lot of waves in New Jersey with his straight talk (and action) about the states’ financial situation. Very few people are ambivalent about this man. Almost without exception, they love him or hate him. Politics aside, I can tell you that he is remarkably approachable for autograph collectors. I have obtained his signature on three occasions. Each time he has signed multiple items for me and, I have seen him sign for virtually everyone who asks. He loves to chat and will answer any question a collector asks. Hope you liked this blog on Governor Christie. Check out my autograph web store at www.autographedfirstdaycovers.com. This entry was posted in Uncategorized and tagged 2012 election, Presidential election, Tea Party. Bookmark the permalink. Hello, just stumbled on this webpage from mixx. This isn’t not something I would normally read, but I liked your perspective on it. Thanx for creating a piece worth reading!